River report -- March 22 Back on the river following another lengthy layoff caused by high water. Did sneak in a quick afternoon trip on Pool 6 last Wednesday, which resulted in one small muskie. But back up in the free-flowing river today, on a scouting trip for smallies, with the hope of a muskie or two as well. Water temperature was 40 to 42. The smallies woke up over the course of the day. Ended up getting 10, including three in the 18 to 19 inch range. The rest were in the 15 to 16 inch range. Also got a muskie in the low 30 inch range. 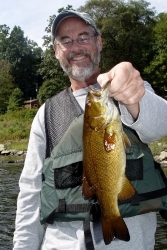 The smallie fishing should only get better, providing the river stays in decent shape, and continues to gradually warm. River Report -- Feb. 26 Really nice to FINALLY get back on the river following tough winter weather, an ice covered river, and sports show obligations. My buddy Andy and I fished Pool 6 on a scouting trip. 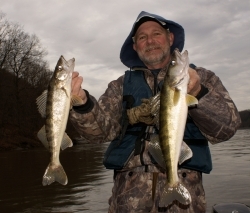 We boated about a half-dozen walleyes up to 22 inches, though most were around 15 inches. The walleyes were really lethargic, and hit bucktail jigs-n-minnows. Just drag them on the bottom, with little to no added action. The river is in nice shape, but access will be tough for a while. When the river receded following higher water, significant amounts of ice chunks were deposited on the bank, in many cases blocking launch ramps. River Report -- January 6 Brought in the new year with a quick trip prior to the next snow storm. Cold air temps and sleet in the air didn't keep us from boating a couple nice 'eyes up to 19 inches. Jig n fathead minnows have been productive, along with jigging spoons tipped with a small fathead minnow. River Report -- Dec 14 First time out for awhile following extreme cold weather, then a period of high water. River still high today, but fishable. Boated about 10 walleyes today up to 20 inches. 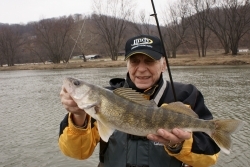 If the river falls about a foot, it will be in excellent shape for winter walleye action. Action today occurred on the southern Venango section of the river. 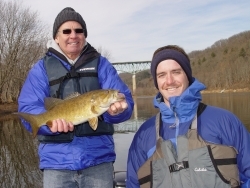 Dec. 3 -- Susquehanna River Had the good fortune to fish with Rod Bates and Dave Neuman of the Koinonia Guide Service today on the Susqy River near Harrisburg. Water was a couple degrees warmer than the Allegheny. 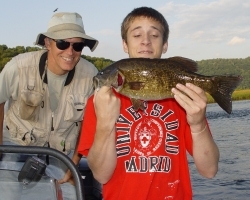 We fished hard, and ended up with 30 quality smallies in the boat, the biggest being an 18.5 incher. Fat, well-fed bass that were set up in a wintering hole. If you ever want to fish the Susqy River, either the main stem or the north or west branch, give these guys a shout. River Report -- Nov 29 Finally got back on the river following two weeks of extreme weather. Water temperature was 12 degrees colder than last trip, thanks to the dramatic change to winter-like weather. Despite 36 degree water temps my guide clients worked hard and were rewarded with four big smallmouth bass up to 19.5 inches, and several walleyes up to 18 inches. The bass bite will be contingent on the weather. A few days of warmer weather will likely spur some activity. Otherwise, the effort will focus on walleyes and muskies. 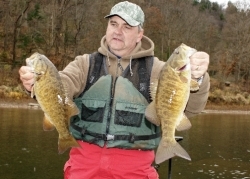 River Report -- Nov. 14 Another great late fall day on the southern Venango County portion of the river. 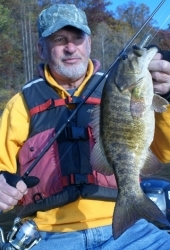 A good smallie bite in the morning and late afternoon, with a bit of a mid-day lull. Really nice-sized fish today, with a bunch in the 18 to 19.5 inch range. Water temp 46, so if the bottom doesn't fall out of things, we should still have some great upcoming action. River Report -- Nov. 9 Cold, breezy day on the northern Armstrong County portion of the river today. 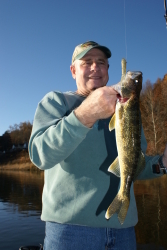 Targeted walleyes and muskies. One short (28-inch) muskie, and a handful of walleyes up to 18 inches. About 15 smallies too. 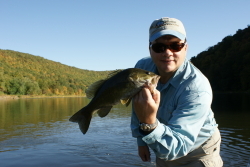 River Report -- Nov 6 The change back to fall-like weather made it feel like November fishing. And the bass must have agreed. 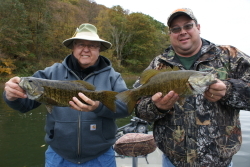 45 smallies today, including some in the 18 to 19.5-inch range. Other than floating leaves clogging the jet outboard a few times, a pretty great late fall day on the southern Venango portion of the river. 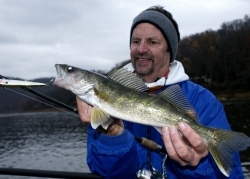 River Report -- Nov 6 Walleyes are starting to show up in greater numbers. Picked up a half dozen walleyes along with about 20 smallies during a short afternoon trip in northern Armstrong County. 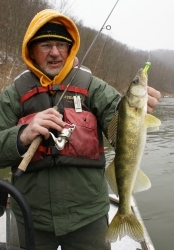 River Report -- Nov 1 Another recon trip, this time in Venango County. Decent day...37 smallies and four walleyes. Not as many big bass as the last trip, but a few fat ones up to 17 inches. Lots of dead grass in the river today. Hampered the effort. If we would get another foot or two of water in the river, which would push the bass up closer to the banks, and add more walleyes and muskies to the mix, the fall bite would really get rolling. River Report -- October 30 Dave Lehman and I did a scouting trip today in northern Armstrong County. 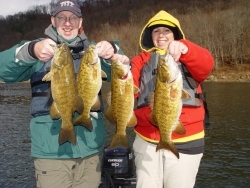 The winter-like weather has dropped the water temperature to the mid 40s; smallmouth are moving into their wintering spots. We caught and release 33, lost/missed at least twice that many. Mostly bigger fish in the 15 to 17 inch range. Also a couple small walleyes. Looks like the late fall bite is here! River Report -- Oct. 17 Cooler weather and cloudy skies helped spur a pretty good bite today. Decent numbers of smallies, and a few good ones. The best one stretched 18.5 inches. A few fish holding in deeper, rocky runs (Dinger water). But most of them still in thin water on flukes and swimbaits. Water temp is 58, with low, clear water conditions. Floating dead grass was a negative factor, especially in the afternoon. River Report -- Oct. 12 High sunny skies and low, clear water added up to a finicky bite this afternoon. Father/son guests Matt & John worked hard for the fish they caught today. Not much coming from the slower waters yet. Biters still in the shallows of flukes. The nice weather has been pleasant, but I'm ready to bring on fall. 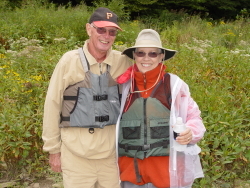 River Report -- Oct. 10 A pleasant day on the river in southern Venango County today. I hosted Joe Rossi and cameraman Greg today, shooting an episode for Joe's Wild Adventures, which airs on Fox Sports Pittsburgh. The big smallies were camera-shy, only following, or worse yet, grabbing the tails of Flukes so they could tease and frustrate. But we did end up catching a pretty good bunch, just not the big ones we would have liked. The bass were still in the shallows, but once the fog burned off, the biters were on the shaded side of the river. All of em Flukes today. Water 58 degrees, and not much in the way of dead floating grass. Ohio River Report -- Oct. 4 Spent the day fishing the Montgomery Pool of the Ohio River fishing and shooting photos. The Ohio rarely fails to show what a diverse fishery it supports, and it didn't today. Smallmouth bass, white bass, freshwater drum, channel cats, flathead cats, sauger (though dink-sized) and even a skipjack herring. Fished the Dashields tailrace, area around old lock&dam 4, and the mouth of the Beaver. Upper Mississippi River -- Sept. 23-25 Attention fellow river rats! If you ever get the opportunity to fish the section of river north of St. Cloud, Minn., jump on it. 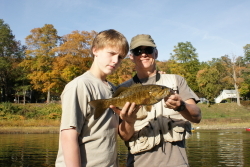 Outstanding fishing for over-sized brown bass. 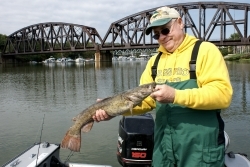 Walleyes and muskies also available, depending upon the section of river being fished. 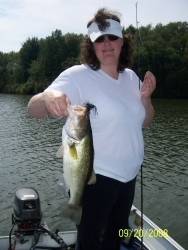 An abundance of lakes in the region provide a long list of additional fishing options. 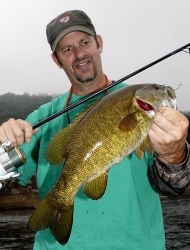 River Report -- Sept. 20 The smallmouth bite was off compared to yesterday, but still decent. 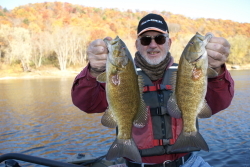 River Report -- Sept. 19 The smallies must be feeing the coming of fall. Good bite today. Must have boated around 60, with a nice bunch of quality fish in the 15-17 inch range. The river's quite clear again, and back to a summertime low level. Still a lot of fish in the shallows, though we did get a few on Dingers in the deeper, slower stuff. A day on Keystone, introducing guests to my summer spot bass spots on the lake, as well as the drop shot technique. Picked up a few largemouth along the deep edge of the weedline, which was only about 8 feet deep, with the lake being seven feet low. The NuMine access isn't an option with a trailered boat. Atwood will be a problem if the lake drops another foot or two. 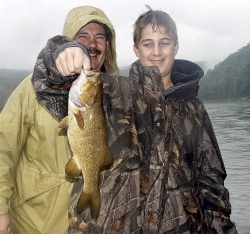 River Report -- Sept. 16 Smallmouth bass in a little bit of a funk following the wild weather (50 mph wind, 20 degree temp drop following "Ike"). About 20 today, but the top end was in the 15 to 16 inch range. River's nice, though, with just a bit of color. River Report -- Sept. 12 Wow...that was the wettest day I've fished in a long time! Pretty much rained all day, and a hard rain at times. Clients hung in there and experienced a good bite. None of the giants of last time, but good numbers and a few nice ones. The rain muddied up the feeder creeks, so expect some color in the river for awhile. Who knows how much color, with Ike's rain forecast to pass through our area on Monday. Lots of floating grass in the water, something that happens every fall as the weeds die off. River Report -- Sept. 7 Best outing in a while. 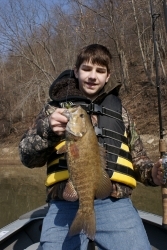 Smallies really on, especially the bigger fish. Two 19 inchers, and several other quality-sized bass. About 30 boated in a four-hour guide trip. River still low and clear, but cooling off a bit. Around 70, a drop of about four to five degrees from mid-week. Cooler temps and rain in the forcast. The bite should continue to be good. River Report -- Sept. 6 A front that brought cloudy skies and cooler temperatures spurred a pretty good bite today. Lots of fish, including a fair amount in the 15 to 17 inch range. Still a lot of fish in shallow, moving water.